Hello from Yuka. 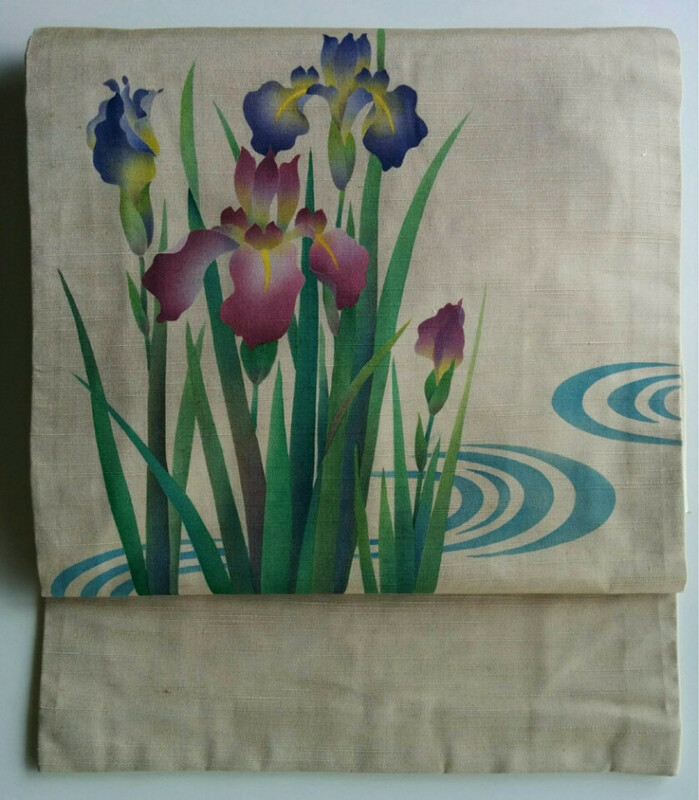 Today I would like to introduce my new friend Naomi san, who is a katazome (stencil) dyer. 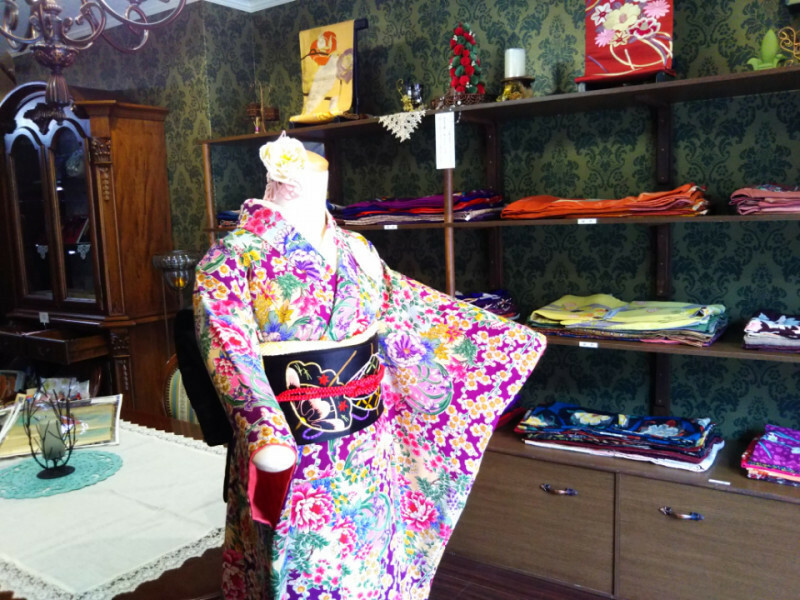 I met her at Akemi san's vintage kimono collection exhibition last year in Nagasaki. 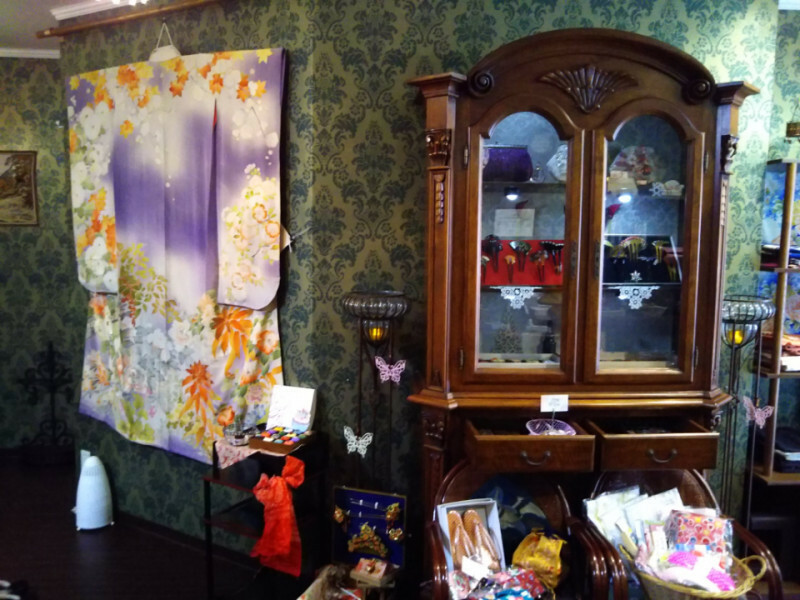 Akemi san is now a shop owner of vintage kimono! She made her dream come true and her store has opened last December.) The name of the store is Beppin (which means very special one!). 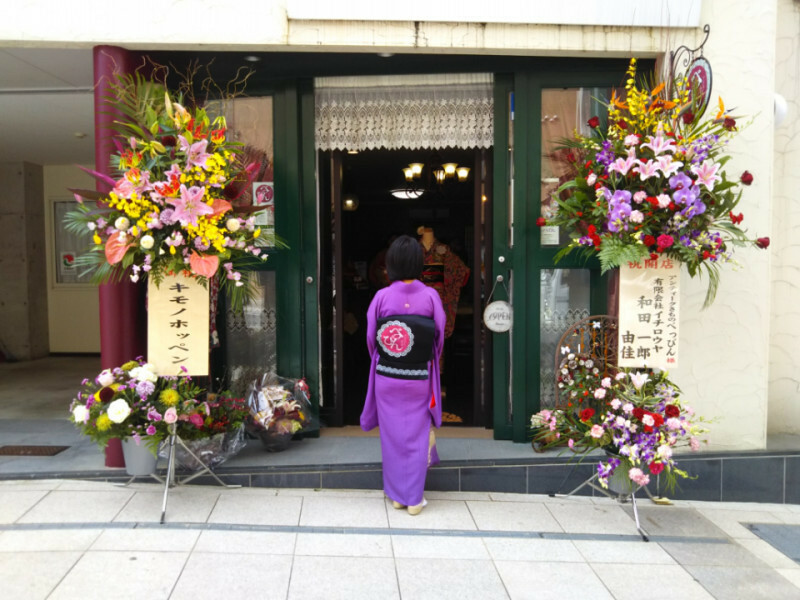 You should visit her store if you come to Nagasaki-her store is the only one vintage kimono shop in Nagasaki and her kimono collection is superb! I am sure you enjoy visiting her store. Naomi san was helping Akemisan at the exhibition. 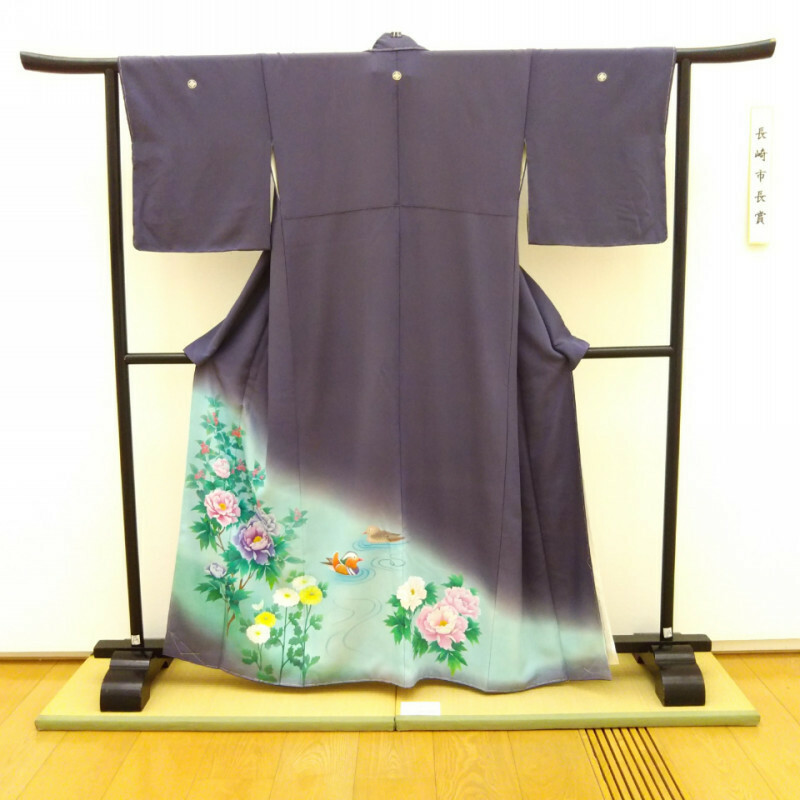 She was wearing an elegant blue kimono at that time. I wish I had a photo of her in kimono but I do not. 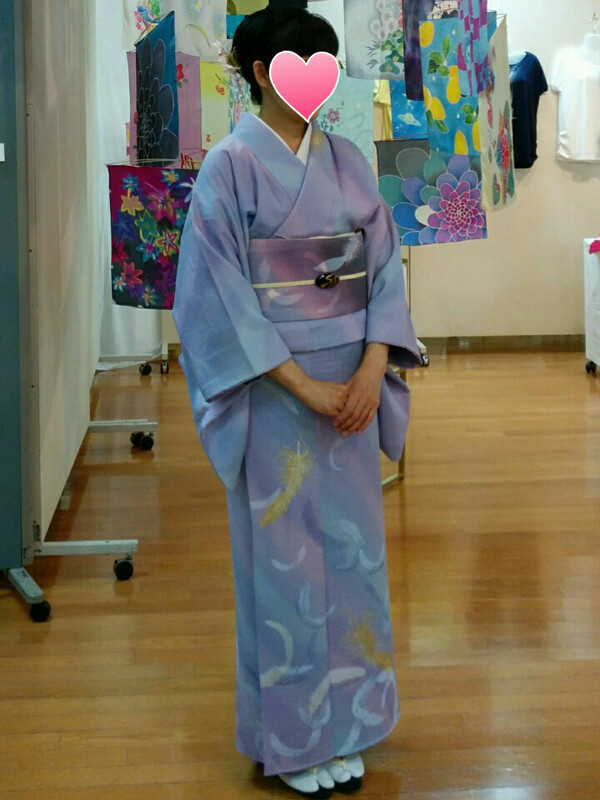 Anyway, she was so elegant and to my surprise, she said she dyed her kimono, obi and also zori ! She was busy helping Akemisan's presentation of the exhibited kimono, so I could not talk that much with her. I was thinking what to wear (Ichiro has a nice set of kimono and hakama now! )and I was at a loss. I remembered the obi Akemisan was wearing a lovely obi with her store logo. Akemisan kindly contacted Naomisan for me and I could meet Naomi san again. She is humble and never show off her work but Akemisan told me she won a prize from the mayor of Nagasaki for her dye work. The kimono on top of this article is her work which won the prize. She is an artist and also having many classes teaching katazome. `Dyer may sound very special' she says but she just likes katazome and wish people to know it is so much fun. She says `I like to dye anything, not only kimono but ANYTHING!'. She says she is not like an artisan in Kyoto. 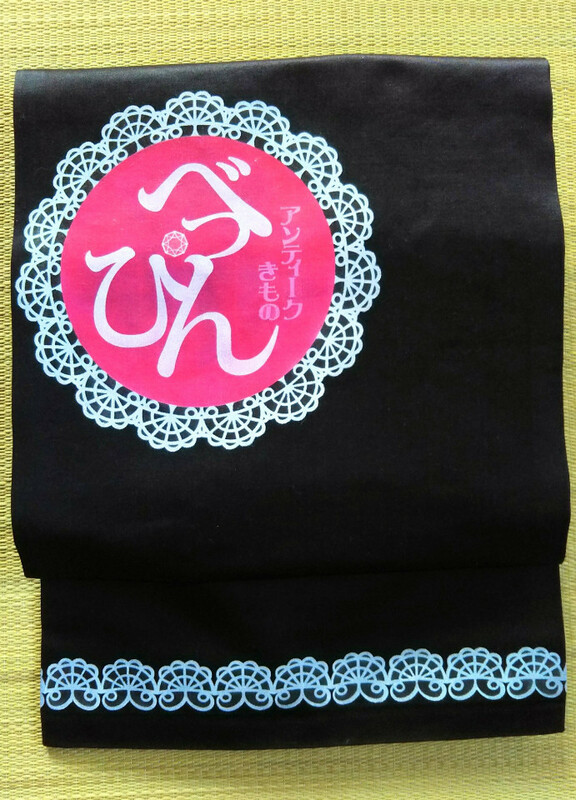 I asked her to dye Ichiroya logo ( I imitated Akemi san)on my obi. You can see Akemi san wearing a black obi with the logo of her store `Beppin'. 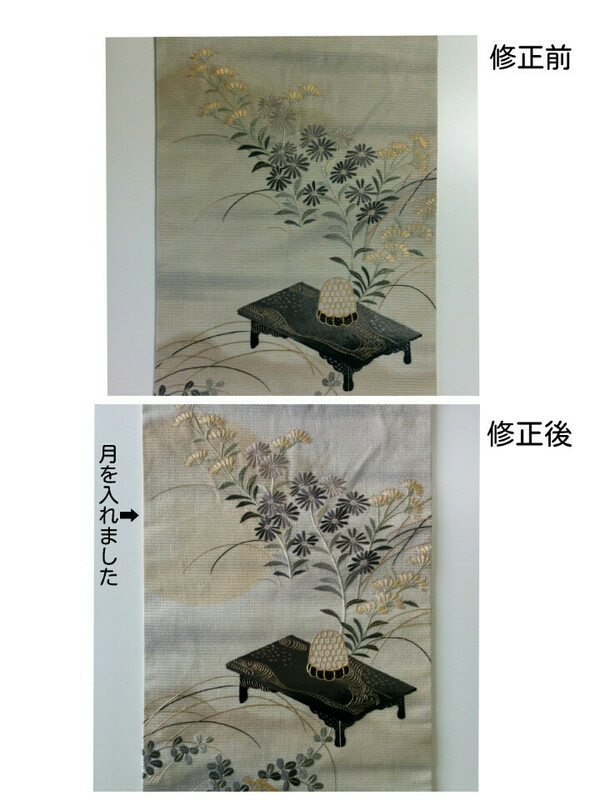 It is their (Akemi san and Naomi san) idea to use black obi. 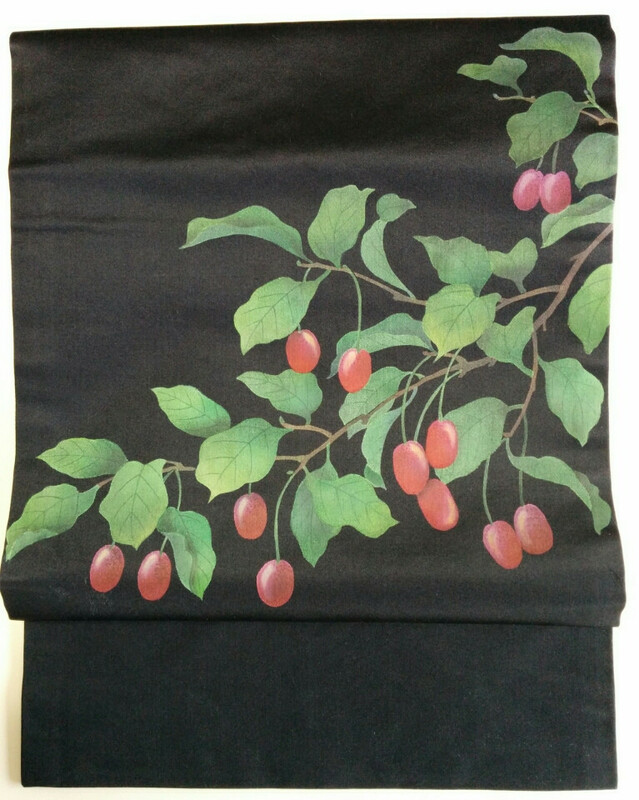 Many people have funeral black obi at home and not used in many case. 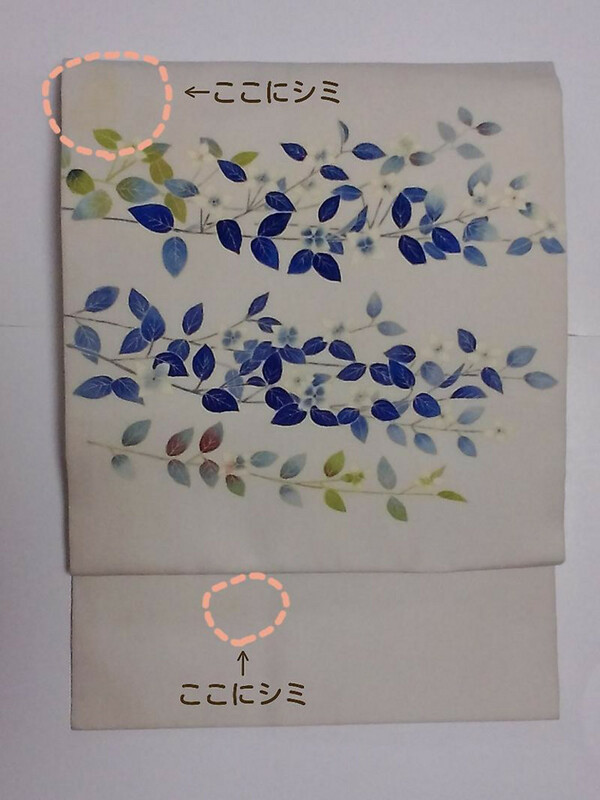 By applying katazome, the obi becomes another obi, not funeral obi! 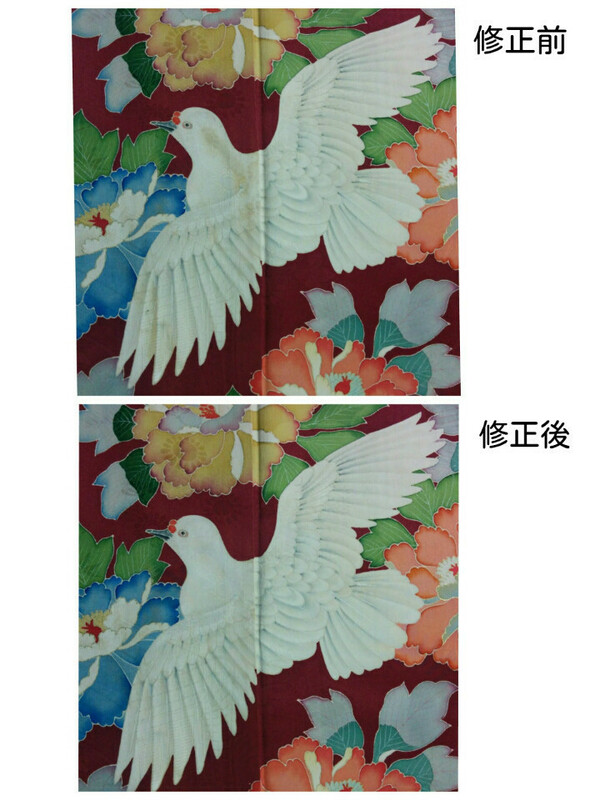 She is adding dye work to old kimono or obi with stains to make them wearable again. Take a look at her wonderful work! Before and after----can you see the moon? See? 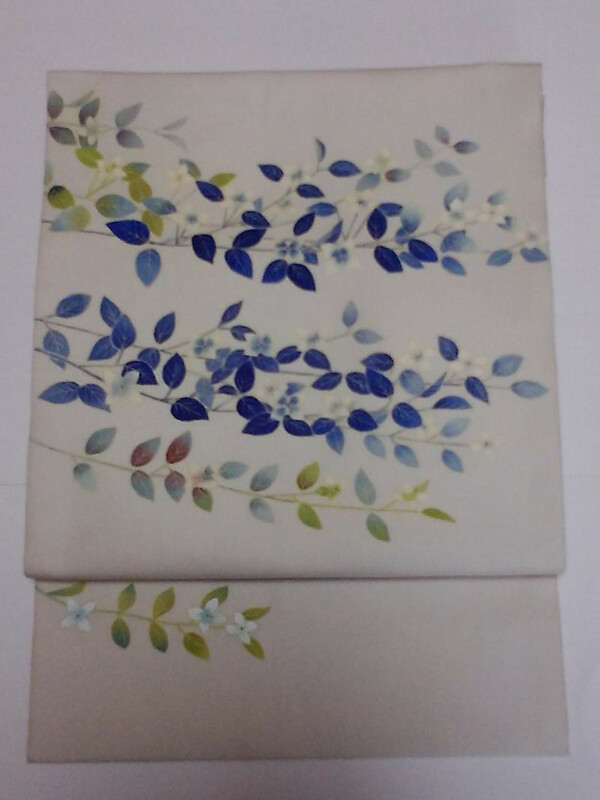 She has made many obi and kimono beautiful to be worn again! I am so looking forward to see my obi ! It will be finished in February. I will be happy to show the obi in our future newsletter.